The rare myeloproliferative disease systemic mastocytosis is characterized by abnormal growth, survival and consequent accumulation of clonal mast cells in one or more organs. In most of these patients the neoplastic mast cells carry the D816V Kit mutation that confers resistance to most drugs and they also overexpress members of the pro-survival Bcl-2 family that prolong cell survival. Here, we examined the combined effects of ABT-737 and Roscovitine on the survival of HMC-1.2 cells, a human mast cell line with the D816V KIT mutation. ABT-737 is a BH3-mimetic that inhibits Bcl-2, Bcl-XL and Bcl-w, while Roscovitine is a CDK-inhibitor that also down-regulates the expression of Mcl-1. 1 mM ABT-737 alone induced 80 % cell death, whereas 30 mM Roscovitine alone caused 70% cell death. 0.05 µM ABT-737 in combination with 10 µM Roscovitine resulted in significant cell death, along with substantial reduction of the level of the pro-survival Mcl-1 protein and up-regulation of pro-apoptotic BimEL. Suppression of the expression of Mcl-1 in HMC-1.2 cells using siRNA, sensitized these cells to ABT-737. This ability of such a low dose of ABT-737 in combination with Roscovitine to induce apoptosis may increase the efficacy while lowering the side effects, perhaps even overcoming drug resistance in connection with treatment of mast cells carrying the D816V KIT mutation. The myeloproliferative disease systemic mastocytosis is characterized by excessive accumulation of aberrant mast cells, particularly in the skin and bone marrow, but sometimes in other tissues as well [1,2]. The symptoms results from release of mediators by mast cells and/or organ failure due to the accumulation of these cells. The development, expansion and survival of mast cell are dependent on stem cell factor (SCF), which binds to the KIT tyrosine receptor on the their surface to activate an intra-cellular signalling cascade. More than 80% of patients with systemic mastocytosis carry the D816Vpoint mutation in KIT [1,3], and also other mutations in KIT , as well as in other genes  have been found in these patients. The D816V mutation leads to a auto-activation of KIT even in the absence of SCF, thereby promoting the growth and survival of the mast cells affected . At present, little is known about other mechanisms that might contribute to the development of systemic mastocytosis. The primary factor supporting the survival of mast cells is SCF, which does so by regulating expression of the members of the Bcl-2 family, and particularly by down-regulating the expression of the pro-apoptotic protein Bim , which also acts as a tumour suppressor in neoplastic mast cells . Mast cells with the D816V KIT mutation exhibit elevated levels of several of the proteins that promote survival, e.g., Bcl-2, Bcl-XL and Mcl-1 [9-11]. Since deregulation of these members of the Bcl-2 family may thus play an important role in the pathogenesis of systemic mastocytosis, several attempts to alter the expression and function of these proteins in mast cells with the D816V KIT mutation have been made [11-13]. The small molecular inhibitor ABT-737 is a BH3-only mimetic that mimics pro-apoptotic Bad and inhibits Bcl-2, Bcl-XL and Bcl-w selectively and with high affinity, thereby inducing apoptosis ; whereas cells whose survival is dependent on Mcl-1 and Bfl-1 are less affected. However, we have previously demonstrated that apoptosis can be promoted in mast cells by ABT-737 . Here, we show that these cells with mutated KIT can be further sensitized to this inhibitor when it is used in combination with Roscovitine, an inhibitor of cyclin-dependent kinase (CDK), which among other effects inhibits transcription of the gene encoding pro-survival Mcl-1 . It is particularly noteworthy that in combination with Roscovitine a dose of ABT-737 as low as 0.05 µM can induce apoptosis in mast cells carrying the D816V KIT mutation. After obtaining informed consent from the donors, human umbilical cord blood was used to develop mast cells either by culturing the mononuclear cell population for 8-10 weeks in RPMI 1640 medium (Sigma Chemicals CO, St. Louis, MO) supplemented with 10% FCS (Gibco, Paisley, Scotland), 50 ng/ml SCF (Biosource International, Inc. Camarillo, CA) and 10 ng/ml IL-6 (PeproTech, London, England); or by culturing CD34-selected cells in serum-free StemPro medium (Gibco) supplemented with 30 ng/ml IL-3 (for the first week only), 50 ng/ml SCF and 10 ng/ml IL-6. Development was evaluated by staining for tryptase, a serine proteinase expressed exclusively by mast cells . The purity of the mast cell cultures employed in experiments exceeded 95%. The use of CBMCs was approved by the ethics committee at the Karolinska Institutet (Dnr 01-374). All participants were informed and provided their written informed consent to participate. The human mast cell lines HMC-1.1 and HMC-1.2 were maintained in IMDM (Sigma) supplemented with 10% FCS, 2 mM L-glutamine, 100 IU/ml penicillin/streptamycine and 1.2 mM monothioglycerol (Sigma) , and passed twice each week. The human mast cell line LAD-2  (kindly provided by Drs. A. Kirshenbaum and D. Metcalfe, NIH, Bethesda, MD, USA) was maintained in supplemented StemPro-34 SFM medium with 100 ng/ml hSCF. Following treatment with 0.05 µM ABT-737 (Abbott Laboratories, Abbot Park, IL) and/or 10 µM Roscovitine (Sigma) for the periods of time indicated, the cells were lysed in SDS lysis buffer (62.5 mM Tris-HCl, pH 6.8, 2% w/v SDS, 10% glycerol, 50 mM DTT, 0.01% w/v bromphenol blue) and then sonicated on ice. The extent of phosphorylation and/or total amount of the various proteins of interest was determined by western immunoblotting employing a NuPAGE Bis-Tris Western gel (NOVEX, Life Technologies, CA, USA). After electrophoresis, the proteins were electro-blotted onto nitrocellulose membranes (Hybond ECL, GE Healthcare, Uppsala, Sweden), and these membranes then blocked in Tris-buffered saline containing 5 % w/v non-fat dry milk and 0.1% Tween 20; incubated with appropriate primary antibody overnight at 4°C; and subsequently exposed to HRP-conjugated secondary antibody for one hour at room temperature. Finally, the proteins were visualized using the enhanced chemiluminescence (ECL) system (LumiGLO, New England Biolabs) and the bands recorded by exposure to Hybond ECL film (GE Healthcare). The following antibodies were used: anti-Bim (Cell Signaling, Technology, Beverly, MA), anti-actin (Santa Cruz Biotechnology Inc, Santa Cruz, CA), anti-Mcl-1 (Stressgene), anti-caspase-3, anti-Bcl-2 and anti-Bcl-XL (Cell Signaling). To monitor apoptosis, HMC-1.2 cells were first stained with propidium iodide (PI, 2 µg/ml) plus FITC-conjugated Annexin V (0.3 µg/ml) and then analyzed in a FACScan (Becton Dickinson, San Jose, CA). The cells that remained viable after 24 to 48 hrs of treatment were counted by FACScan analysis. To inhibit expression of the mcl-1 gene, HMC-1 cells were transfected with 100 nM of either mcl-1 or control siRNA (human MCL-1 siGENOME SMART pool siRNA and non-targeting pool siRNA (Dharmacon inc., Lafayette, CO, USA)) using a Nucleoporator, and the primary mammalian fibroblast basic nucleofector kit (VPI-1002); program X-001 (Amaxa AG, Cologne, Germany), in accordance with the manufacturer’s instructions. Twenty-four hours after transfection viable cells were enriched by using the MACS dead cell removal kit (Miltenyi Biotec, Bergisch Gladbach, Germany, again according to the manufacturer’s protocol); treated with 0.05 µM ABT-737 for 24 hrs; counted; and then lysed and prepared for western blotting. Statistical analysis was performed using the Student t-test, where the P values * P<0.05, ** P<0.01 and *** P< 0.001 indicate statistically significant differences. Examination of the steady-state expression of the pro-survival Bcl-2 family proteins, Bcl-2, Mcl-1 and Bcl-XL in the mast cell lines HMC-1.1, HMC-1.2 and LAD-2; and in primary mast cells derived from cord blood (CBMCs), revealed different patterns of expression. The cell lines expressed all of the examined proteins, whereas CBMCs expressed Mcl-1 and Bcl-XL, but not Bcl-2 (Figure 1). Figure 1. Expression of members of the Bcl-2 family by resting mast cells. 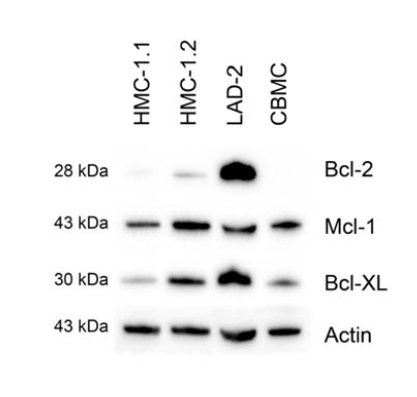 The steady state levels of Mcl-1, Bcl-2 and Bcl-XL in CBMC, and LAD-2, HMC-1.1 and HMC-1.2 cells were determined by western blotting, employing actin as a loading control. Shown is one representative experiment of 3. HMC-1.2 cells were treated for 24 and 48 hrs with ABT-737 (0.02 µM to 1 µM; Figure 2A) and Roscovitine (1 to 30 µM; Figure 2B) and their viability then determined by flow cytometry. The highest drug doses induced 70-80% cell death after 48 hrs treatment. 30 µM Roscovistine was found to have some inhibitory effect on the expression of Mcl-1, and this inhibition was enhanced by 0.5 µM ABT-737 when Mcl-1 protein expression was abolished (Figure 2 C). 0.05 µM ABT-737 and 10 µM Roscovitine, i.e., the highest dose that had little or low effect on the survival of HMC-1.2 cells after 24 or 48 hrs of exposure (Figure 2A and B) were chosen for further investigation. Figure 2. Dose-response effects on the reductions in mast cell survival and Mcl-1 expression caused by ABT-737 and Roscovitine. 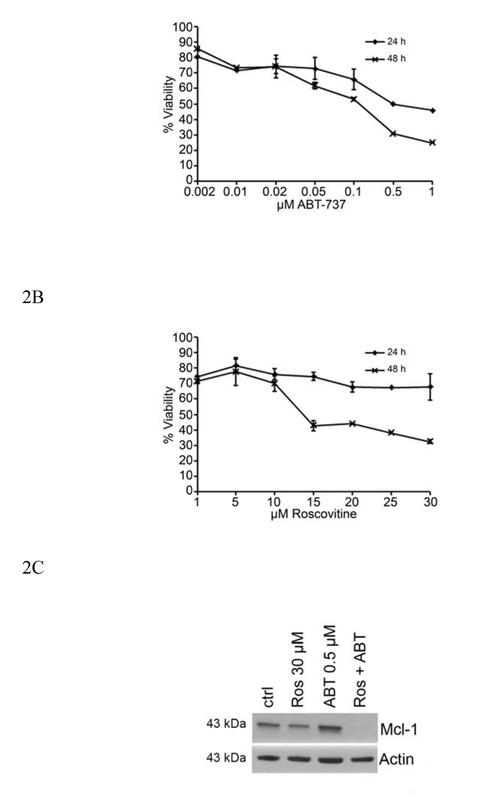 HMC-1.2 cells were treated with different doses of (A) ABT-737 or (B) Roscovitine for 24 and 48 hrs and their viability then measured by flow cytometry. (C) High doses of ABT-737 (0.5 mM) and/or Roscovitine (30 mM) reduce the level of Mcl-1 protein expressed by HMC-1.2 cells. Values shown are mean ± SD; n=3. ***p<0.001. When HMC-1.2 cells were treated with Roscovitine and/or ABT-737 and their viability then determined by flow cytometry after 24 and 48 hrs (Figure 3), 0.05 µM ABT-737 and 10 µM Roscovitine alone had little effect, but the combination of these two significantly reduced cell viability at both two time points (Figure 3). Figure 3. Low doses of ABT-737 and Roscovitine exhibit synergistic effect in inducing mast cell death. Survival of HMC-1.2 cells was measured following 24 and 48 hrs of treatment with 0.05 µMABT-737 and/or10 µM Roscovitine. Values shown are mean ± SD; n=3. Since we saw a synergistic effect when Roscovitine was used in combination with ABT-737 we next investigated if this effect was due to specific Mcl-1 inhibition, or other effects of Roscovitine. After incubation for 24 and 48 hrs, 0.05 µM ABT-737 had no effect on the survival of HMC-1.2 cells transfected with control siRNA, while significantly reducing the survival of cells transfected with Mcl-1 siRNA (Figure 4A). 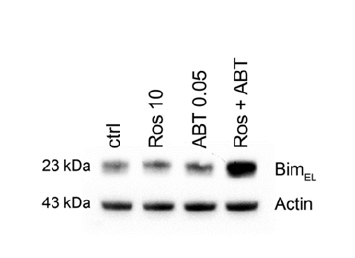 In addition, ABT-737 reduced the expression of Mcl-1 by cells transfected with Mcl-1 siRNA and addition of Roscovitine potentiated this reduction (Figure 4B). Figure 4. Suppression of Mcl-1 expression with siRNA sensitize the cells to ABT-737 induced apoptosis. 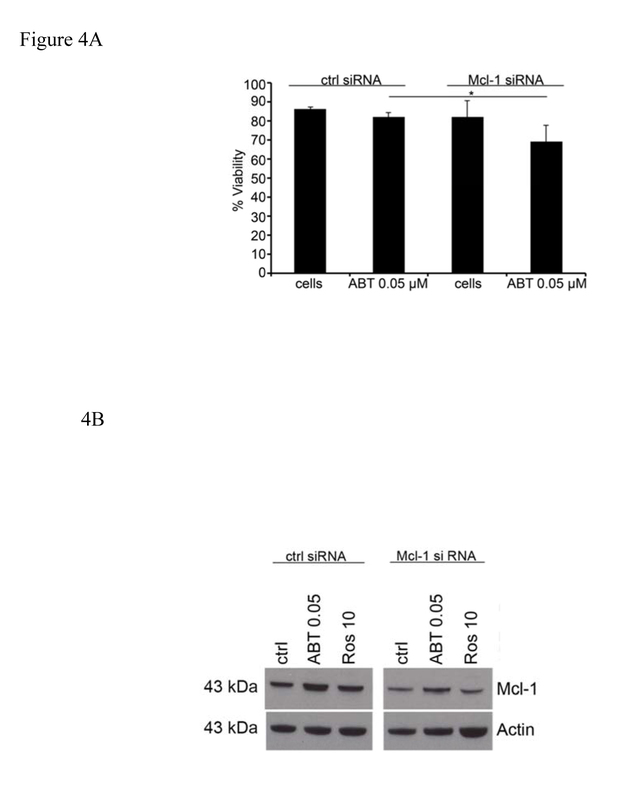 Following transfection with Mcl-1 or control siRNA, the survival of (A) and expression of Mcl-1 protein by (B) HMC-1.2 cells, after incubation with 0.05 µM ABT-737 and/or 10 µM Roscovitine was determined. Values shown are mean ± SD; n=3. * p<0.05. We demonstrated previously that SCF promotes mast cell survival by regulating expression of the BH3-only protein Bim and that BimEL is up-regulated and induces apoptosis in HMC-1.2 cells treated with the proteasome inhibitor MG132 [12,20]. Here, we detected potent up-regulation of BimEL in HMC-1.2 cells co-treated with 0.05 µM ABT-737 and 10 µM Roscovitine, but not with either drug alone (Figure 5). Figure 5. Pro-apoptotic Bim is up-regulated by treatment withABT-737 and Roscovitine in combination treatment. HMC-1.2 cells were exposed to 0.05 µM ABT-737 and/or 10 µM Roscovitine for 24 and 48 hrs and the level of BimEL protein then determined by western blotting. Shown is one representative experiment of 3. * p<0.05; ** p<0.01. Apoptosis induced by members of the Bcl-2 family finally leads to activation of effector caspases, including caspase-3, that executes the actual killing of the cells. Although either ABT-737 or Roscovitine alone induced a certain amount of cleavage of pro-caspase-3 into active caspase-3 in HMC-1, the combination of these drugs was much more potent in this respect (Figure 6A). Addition of the caspase inhibitor z-VAD-fmk to the cell culture medium blocked this caspase-3 activation (Figure 6A). Figure 6. 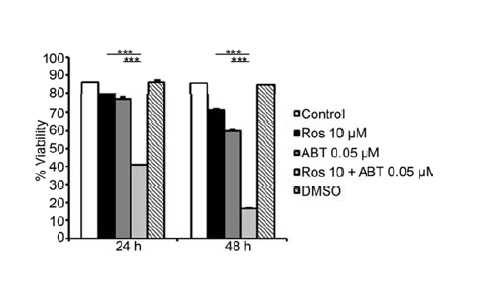 Combined treatment with ABT-737 and Roscovitine activates caspase-3 and cell death. Cleavage of pro-caspase-3 into activated caspase-3 was determined by western blotting after exposing HMC-1.2 cells for 24 hrs to ABT-737 and/or Roscovitine. Pre-treatment with 100 µM z-VAD-fmk, a caspase inhibitor, attenuated both caspase-3 activation (A) and the reduction in cell viability (B), assessed by Annexin V/PI-staining and flow cytometry. The results shown are representative of three independent experiments. Values shown are mean ± SD; n=3. To investigate if cell death upon ABT-737 and Roscovitine treatment was caused by activation of caspase-3 we also included z-VAD-fmk to the cultures and measured cell viability. After 24 and 48 hrs of exposure, both Roscovitine and ABT-737 alone reduced the viability of HMC-1.2 cells somewhat (Figure 3), but in combination this effect was much more pronounced (Figure 6B). Addition of the caspase inhibitorz-VAD-fmk abolished the cell death induced by 0.05 µM ABT-737 and 10 µM Roscovitine (Figure 6B), suggesting that apoptosis in response to these drugs is at least partially caspase-3-dependent. The present study demonstrates that by targeting pro-survival Bcl-2 proteins with suboptimal concentrations of ABT-737 and Roscovitine together, synergistic promotion of apoptosis in HMC-1.2 cells containing the D816V KIT mutation can be achieved. This cell death is mediated by reduced expression of Mcl-1, inhibition of Bcl-2, Bcl-XL and Bcl-w, elevated levels of the BimEL protein; and activation of caspase-3. The present lack of an effective treatment for systemic mastocytosis makes it urgent to develop novel therapeutic strategies that do not simply alleviate symptoms. Many candidate drugs cannot be used because of the side-effects associated with therapeutic doses. Combining two drugs at lower doses might reduce side-effects while enhancing efficacy, perhaps also circumventing drug resistance. The small molecular inhibitor ABT-737, developed as a mimetic of the pro-apoptotic BH3-only protein Bad and known to induce apoptosis and have anti-tumour properties [14,21], has little effect as a single agent on a variety of human cancer cell lines, but acts synergistically with low doses of other chemotherapeutic agents or radiation [22-24]. We reported previously that mast cells are sensitive to ABT-737 . However, cells whose survival is dependent on Mcl-1 and/or Bfl-1 are less sensitive to this compound which binds selectively and with high affinity to Bcl-2, Bcl-XL and Bcl-w . Mast cells in systemic mastocytosis express elevated levels of Mcl-1 , and therefore in attempt to increase their sensitivity to ABT-737, we applied this drug in combination with Roscovitine, an inhibitor of Mcl-1 transcription . First, HMC-1.2 cells were treated with ABT-737 or Roscovitine alone to determine the highest doses with little or no effect on mast cell survival. Surprisingly, these doses of 0.05 µM ABT-737 and 10 µM Roscovitine reduced mast cell viability synergistically, to an extent comparable to that obtained with a single high dose of each drug alone. Similarly to what we found in HMC-1.2 cells, multiple myeloma cells treated with 30 µM Roscovitine exhibit strong inhibition of Mcl-1 . 0.05 µM ABT-737 in combination with 10 µM Roscovitine and also effectively reduced this expression in HMC-1.2 cells, while inducing the expression of the pro-apoptotic protein BimEL. This combined loss of one member of the pro-survival Bcl-2 family and up-regulation of a member of the pro-apoptotic Bcl-2 family provide a key to reducing mast cell survival. We observed previously that normal mast cells cultured in vitro up-regulate Bfl-1 and Mcl-1 in order to survive IgE-receptor-mediated activation . The balance between the pro- and anti-apoptotic Bcl-2 proteins determines whether the cells are rescued from apoptosis or sentenced to cell death. However, if one survival gene is down-regulated, others genes might be up-regulated to compensate for this loss and restore the balance. For this study we used the BH3-mimetic ABT-737. Obatoclax is another BH3-mimetic that has been shown to synergize with the multikinase inhibitor Sorafenib to reduce Mcl-1 expression and promote apoptosis in human acute myeloid leukemia cells . Upon cotreatment of HMC-1.2 with ABT-737 and Roscovitine, we also observed reduced expression of Mcl-1 together with elevated levels of the pro-apoptotic BimEL protein and activation of caspase-3, an executer for cell death. Pre-treatment of the cells with the pan-caspase inibitor z-VAD-fmk blocked both activation of caspase-3 and cell death, suggesting that the apoptosis is at least partially mediated by this protease. To confirm further that Mcl-1 is important for mast cell survival in cells with D816V KIT mutation, the levels of this protein was reduced with siRNA, which in combination with ABT-737, enhanced cell death. However, this reduction in cell survival was not as pronounced as when ABT-737 was applied in combination with Roscovitine. This may be due to more effective suppression of the expression of Mcl-1 by Roscovitine than siRNA, and/or because Roscovistine exerts other effects that influence the survival of HMC-1.2 cells. Nevertheless, our present findings demonstrate that drugs applied together at suboptimal concentrations can cause the death of mast cells carrying the D816V KIT mutation. We would like to thank Mrs. Agnetha Beinhoff and Ms. Ulrika Edbäck for their excellent skill in culturing the mast cells. This work was supported by the Swedish Cancer Society, the Swedish Research Council – Medicine and Health, the Cancer and Allergy Foundation, Hanz von Kantzows Foundation, Lars Hiertas Memorial Foundation, Magnus Bergvalls Foundation, and Karolinska Institutet. ©2015 Lyberg K. This is an open-access article distributed under the terms of the Creative Commons Attribution License, which permits unrestricted use, distribution, and reproduction in any medium, provided the original author and source are credited. Department of Medicine, Clinical Immunology and Allergy Unit, Karolinska Institutet and Karolinska University Hospital, KS L2:04, SE-171 76 Stockholm, Sweden, Tel: +46-8-517 702 05, Fax: +46-8-335 724.